Remember the adult who was there for you when you were a child? Maybe they were a youth leader, neighbor, teacher, coach, or even a family friend. Through Camp Fire, you can work directly with young people by teaching workshops or classes, leading small groups, counseling at summer camps, or advising older youth as they plan activities. You can also support Camp Fire in the areas of fund development, event planning, consulting, public relations, retail, clerical help, or camp maintenance. Volunteers also guide and manage the Camp Fire Council and its programs as committee members. Whether it’s tutoring students after school, securing donations for our online auction, or checking in guests at our annual fundraisers, we can use your help. Volunteers help in ways that fit their time schedules and receive training and support from staff. 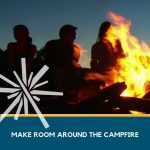 Camp Fire is always seeking qualified candidates to join our Council Board or Committees. Please contact us for further information about our nominating process and procedures. No experience needed; just an earnest desire and commitment to work to make Samish Council the best it can be. For more information, please contact the office via e-mail at info@campfiresamish.org. We look forward to hearing from you and hearing your ideas! We have a variety of work study positions advertised at WWU.